Mid-term management plan that is lacking in concreteness | Improve Tosho’s shareholders’ value Strategic Capital, Inc.
Tosho has released its mid-term management plan on 27th February 2017 with a PL targets. This 3 years plan is the first period of 3 stages which consist of 9 years plan in total. There is no data available for the concrete target of the second and the third period. Tosho only released targets of the first period as below. ※Calculated as “Recurring pre-tax profit times (1-tax rate 30%) divided by average net assets”. This is to exclude special profit. Recurring pre-tax profit is called “Keijo Rieki” in Japan. ※※ROE in FY 2016 including special profit is 16.9％. The gain from the sales of a half of RECRUIT shares was reported as special profit of ca. 16.4 bil. ※※※ROE in FY 2017 including special profit is 1.2％。The gain from the sales of affiliated company shares was reported as special profit of ca. 0.7 bil. Following slide is an abstract of the presentation (page 36 from the link above). It is described that operating profit and EBITDA grow strongly throughout the second and the third period. The red bar is operating profit and green bar is depreciation and amortization. Meanwhile, there is no clear explanation in the plans how to achieve the target and no progress is found as to the achievement of the investment plan. In fact, Tosho’s managements did not answer our question regarding this point at the last AGM and made shareholders confused. 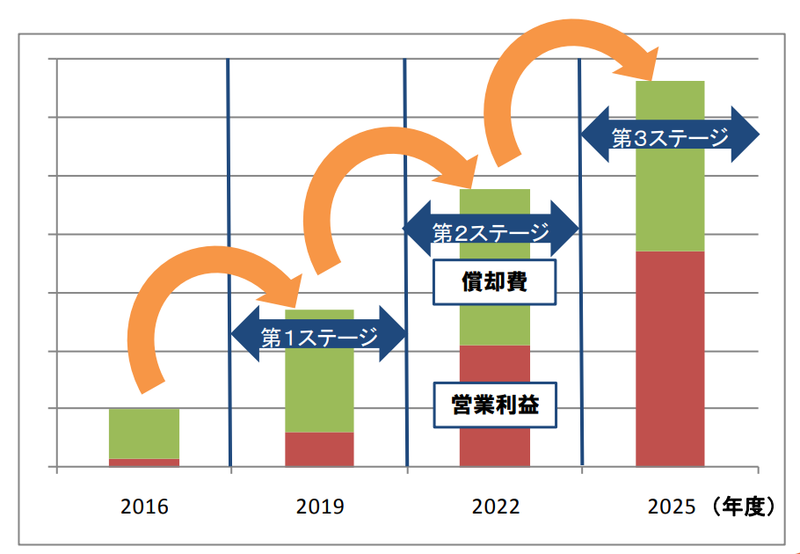 ■ It is reasonable to improve low operating profit by changing its business structure. ■ Tosho should immediately start this because improvement of profit is an urgent issue. ■ Tosho should disclose and inform the market about the cost and return expectation for the change of its business structure. Are you really going to invest remaining 8 bil in 2 years in order to change the business structure? Could you explain how this investment of 10 bil in total will contributes to profit? Mr. Yano： Certainly, the investment in the first year was 1.5 bil. But 60% – 70% of the orders are already executed and the remaining is almost at the final stage. In terms of margin improvement, we focus on the reduction of variable cost and fixed cost. In addition, we want to reduce other cost such as personnel expense, outsourcing cost and material cost. 20 bil is too much for Tosho to invest in new business area by itself. In case such huge investment is justified, this should be determined by whole Toppan printing group (Toppan printing is Tosho’s parent company). ■The first acquisition was executed in October 2018. It was a small textbook company and the amount of investment was merely 1.1 bil. Now that 1 year has passed since the release of the plan and only 1.1 bil out of 20 bil was executed, you should reconsider the investment plan in new business area, at least reduce the investment amount. In terms of profit targets, you need to change the strategy or targets themselves. It’s only normal to reconsider and change the plan when it is difficult to achieve. Don’t waste remaining 2 years. You should revise the plan. Mr. Yano：We are working on the achievement of the plan right now. We are working hard and trying to achieve the targets of the present plan. Mr. Kawada：We focus on the prompt execution of investment.